They Are Billions is real-time strategy based game, that is set in a dystopian future where a zombie infection has brought the human race to a minimal 4,612 people worldwide. Build your colony and defend it against the billions of infected that roam the Earth. This game is based off strategy, not the player’s performance. 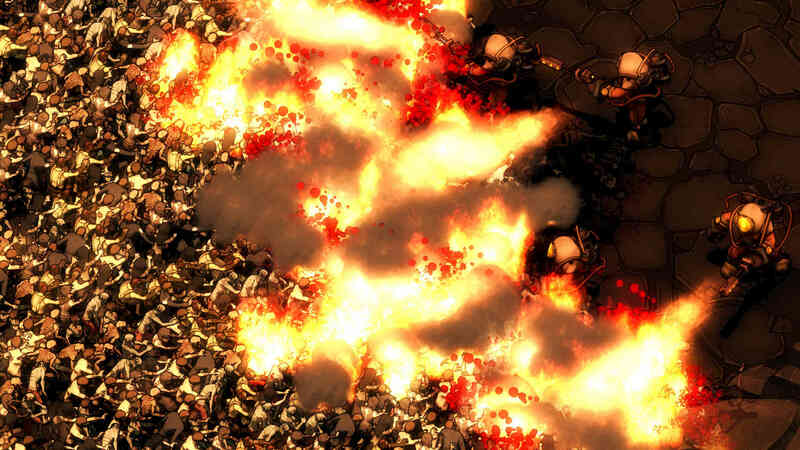 They Are Billions is able to run more than 20,000 units on the screen at once, meaning you as the player must think strategically and tactically to defend yourself from thousands of infected. The game really pushes your limits and tests your abilities to both defend while having to build up a colony in order to survive. One of the most helpful abilities demonstrated is their pause mode; in real time you may plan your strategy and construct buildings with no rush at all, even in the middle of an attack. During the game you, the player, must venture out and gather resources and colonists, all the while crafting energy resources and walls to prevent the infected from taking over your colony. It’s up to you to form an army by training mercenaries that demand money and food in return for protection. It is important to note that once a building is taken over, all of the workers and colonists will become infected and aid in the onslaught. As your people are turned, you will gradually feel more and more alone as you try to defend yourself against your own colonists and the oncoming horde. Can the few out gun the many? 4K graphics portray the beautiful Victorian steampunk art style all in real time. There are two modes to choose from, survival mode and campaign mode. In survival mode, you must last 100 days against the infected in a random world and can even play in a challenge of the week where many players build their colonies alongside yours, in the same world, and make it onto the leaderboard. In campaign mode, however, you have to help mankind get back onto its feet with dozens of different missions and goals, all the while discovering new technology and upgrades; you alone choose the path of progression for your colony and the fate of humanity.